The long-term effects of unhealthy eating now rank higher than smoking as a direct cause of poor overall health as we age. Poor nutrient intake results in a higher risk of developing multiple preventable chronic diseases, and unfortunately, premature death. 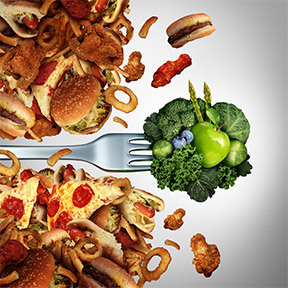 An unhealthy diet largely consists of oversized portions, processed foods, sugary beverages and more calories than are needed to maintain a healthy weight, and lacks sufficient intake of vegetables, fruits, whole grains, healthy fats, fiber, and the critical nutrients needed for proper bodily function. When we regularly consume foods s that are full of added sugars, unhealthy fats and excess sodium, such as double cheeseburgers, extra-large fries and supersized soft drinks, are many of us thinking about what happens when the meal is over? Of course, some certainly are. However, the majority may never give any thought to the added burden placed on the body to digest and process non-nutritive foods nor the increased risk of a shortened and poor quality lifespan that an unhealthy lifestyle can bring. Not a pleasant thought, but the reality is that without good nutrition, good health is not possible. According to the Center For Science In The Public Interest, an unhealthy diet combined with a sedentary lifestyle is the leading cause of disability and the loss of independence. Statistics show that only a small percentage of the general population follows a diet consistent with nutrient guidelines recommended by the USDA. Occasionally indulging in low-nutrient foods as a special treat may not be problematic. However, the evidence is clear that eating poorly most of the time can have deleterious health consequences that many may not associate with their diet. Cardiovascular disease – Cardiovascular disease is to a large extent attributed tounbalanced diets and physical inactivity. Type 2 diabetes, eye and kidney diseases – Obesity and inactivity largely account for the escalating rates of type 2 diabetes. Diabetes can lead to increased risk of stroke, as well heart, kidney and eye disease. High blood pressure, triglyceride and cholesterol levels – These are all factors in the diagnosis of metabolic syndrome and increased risk of developing chronic diseases. Osteoporosis – Adequate vitamin C and calcium, along with sensible sun exposure and physical activity is necessary to strengthen bones and muscles. Obesity – The imbalance between low energy expenditure and high caloric intake are the main determinates in the obesity epidemic. Osteoarthritis – The most important relationship between diet and arthritis is a healthy weight. A whole food nutritious diet has anti-inflammatory effects to help ease arthritis symptoms. Combining a healthy diet with regular exercise will assist weight loss, and take pressure off joints for pain reduction. Cancers – Although tobacco use is still the number one cause of cancer, dietary factors contribute significantly. Maintaining a healthy weight, limiting alcohol, and ensuring adequate whole food intake can reduce cancer risks. Remember for many people chronic disease is not inevitable. The quality of food consumed in relation to physical activity are the key determinates of nutrition related chronic diseases. Making better food choices puts you in control of your health and quality of life. Physical activity to balance energy intake plays an equally essential role in determining health and longevity and is key to maintaining proper weight for optimal health. When you make healthy nutrition and physical activity a priority, weight loss and improved metabolic health should naturally follow. To foster strength, energy and health, eat nutritious foods and find time to be active every day. PGX® Daily by Bioclinic Naturals – PGX® provides a highly viscous blend of purified soluble fibers that support healthy glucose and cholesterol levels already within the normal range. Its many diverse benefits include support of a healthy glucose metabolism, lowered glycemic index of meals, reduced appetite, improved regularity and more normalized blood sugar. PGX® Daily Granules also available for those who prefer to mix the fiber with a beverage of choice. Gluten, dairy and yeast free. Cardiogenics® Intensive Care by Metagenics – This comprehensive formula provides a blend of minerals, amino acids, antioxidants and botanicals in support of healthy coronary artery blood flow, heart muscle function and overall cardiovascular health. Gluten, soy and dairy free, Non-GMO vegetarian formulation. Advanced Inflammation Support by Complementary Prescriptions – This multi-modal botanical formula is designed to help combat inflammation triggered by sleep deprivation, poor diet, sedentary behavior and other unhealthy lifestyle factors. Cal Apatite Bone Builder® Forte by Metagenics – This premium formula provides bone health support with vitamin D3 and a full spectrum of macro and micro minerals that naturally comprise healthy bone. Research backed MCHC supplies naturally occurring minerals, bioactive bone growth factors, type 1 collagen protein and vital bone proteins for enhanced bone nourishment. Gluten and soy free, Non-GMO formulation. This entry was posted in Home and tagged Advanced Inflammation Support by Complementary Prescriptions, Cal Apatite Bone Builder® Forte by Metagenics, Cardiogenics® Intensive Care by Metagenics, Good Nutrition for Good Health, PGX Daily by Bioclinic Naturals, Professional Supplement Center, Vitamins and supplements, www.professionalsupplementcenter.com. Bookmark the permalink.